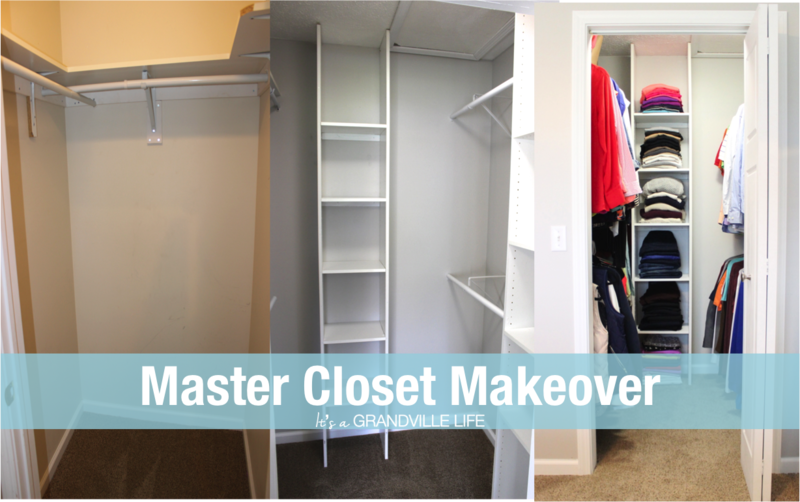 A few weeks back, we finished a very important makeover in our house, the master closet. 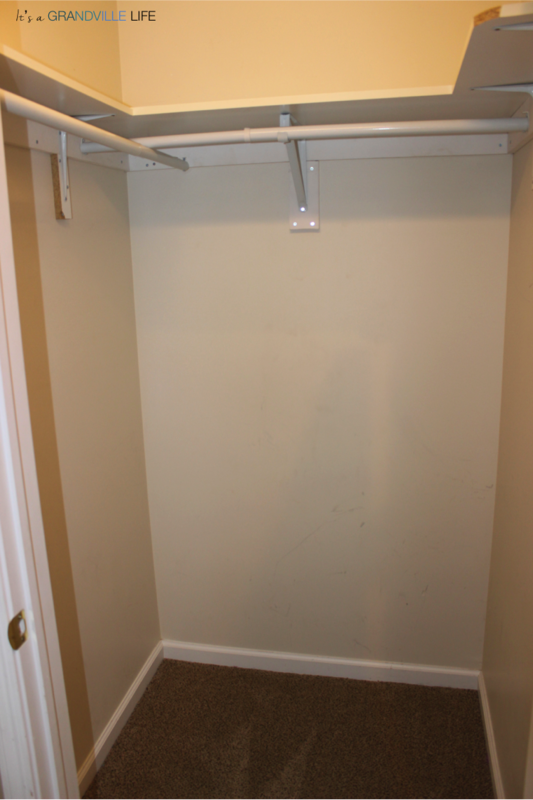 When we bought the house, the master closet lacked functionality and did not maximize space by any means. I own an unhealthy amount of clothes so it was important that we built a space where both of us could fit a lot of our wardrobe. We did the whole makeover for under $100, and it ultimately was well worth the investment. 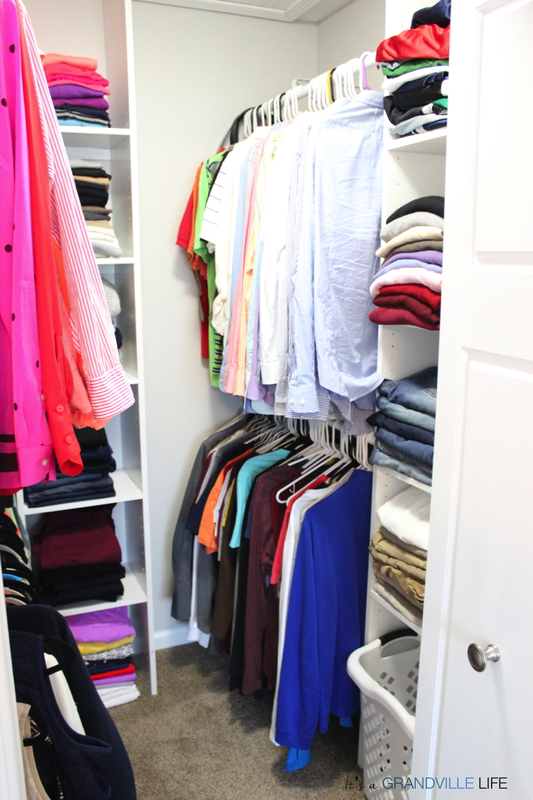 Here we have a picture of what the master closet looked like before but only larger. (The image shown is of the front close because Paul started tearing the master closet apart while I was away for work, so this was the next closest thing). 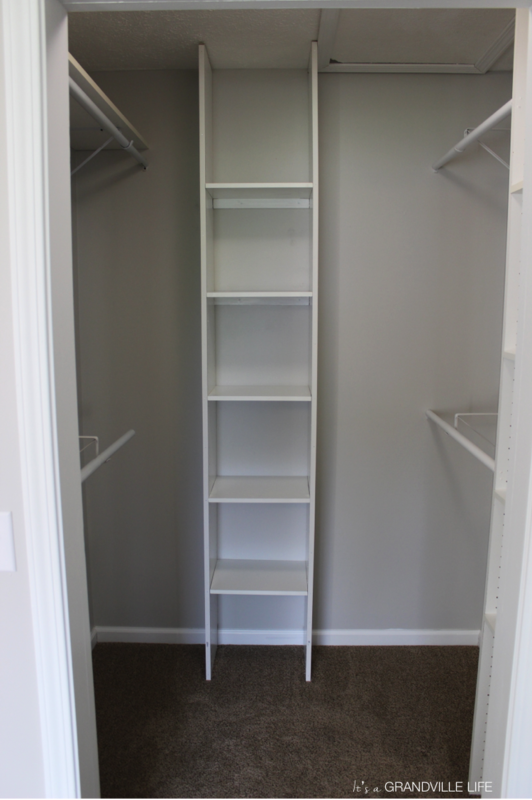 Like in the picture shown, the master closet had shelves only at one level and they interlocked in the corners, therefore minimizing the space. 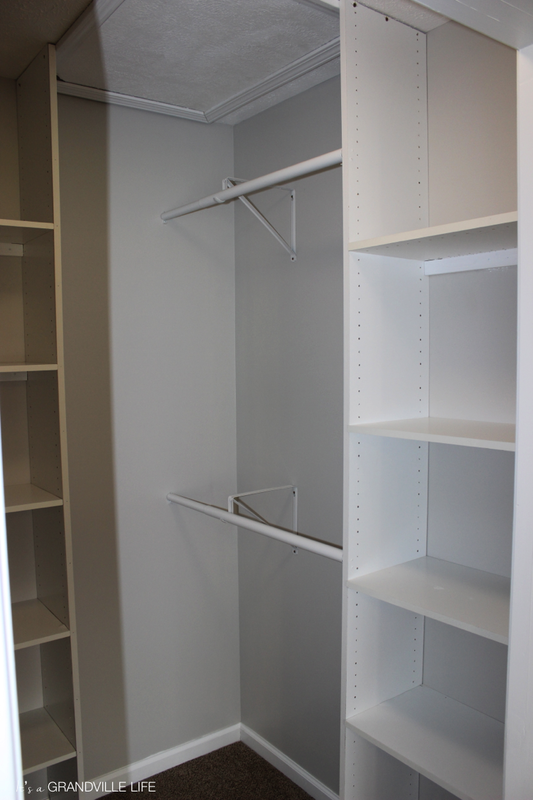 The only difference between the closet shown and the master closet was that instead of the shelf on the right, the master closet had a vertical shelving unit. The biggest problem, was that the door to the closet was inward swinging. 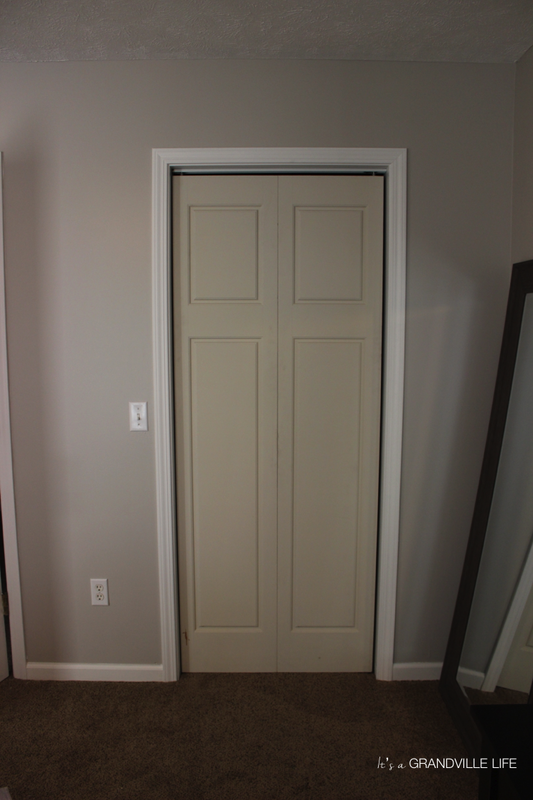 That meant in order to access the left side of the closet you had to walk into the closet and close the door behind you. Knowing that this wasn't going to work for us, we decided to make it over before ever moving any clothes into it. 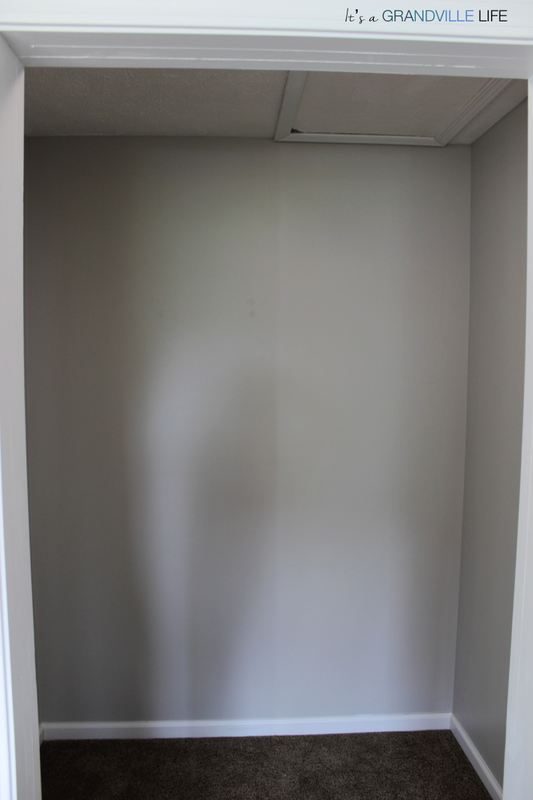 The original master closet had one shelf in it but stopped midway up the wall. We kept this on the wall during the painting process since we were going to put a shelf in the corner anyways. 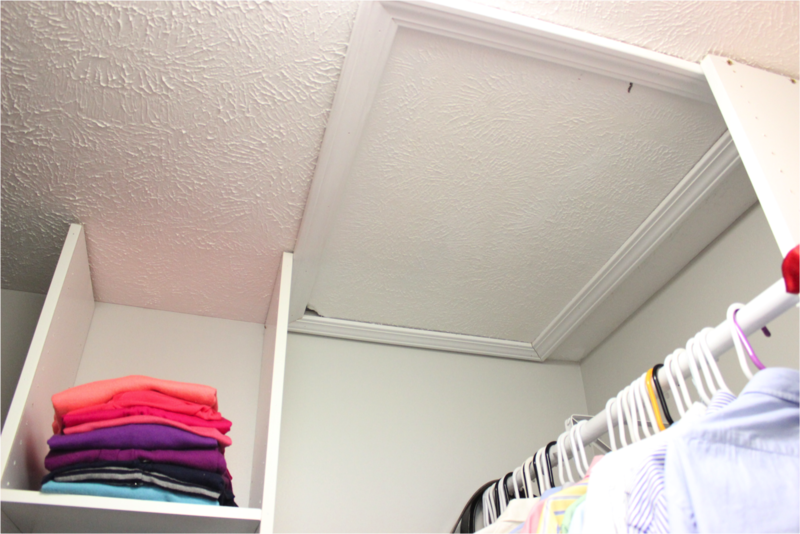 To maximize the space of the closet, we designed the closet to have the shelves go to the ceiling. 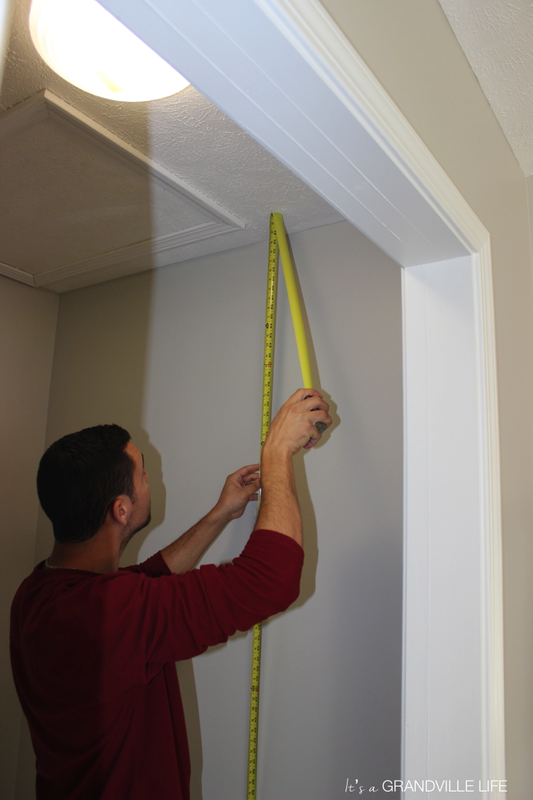 Once we measured how tall the boards had to be to go to the ceiling, Paul cut the boards to size using a circular saw. Here is the first board installed which will create one of the shelving units. 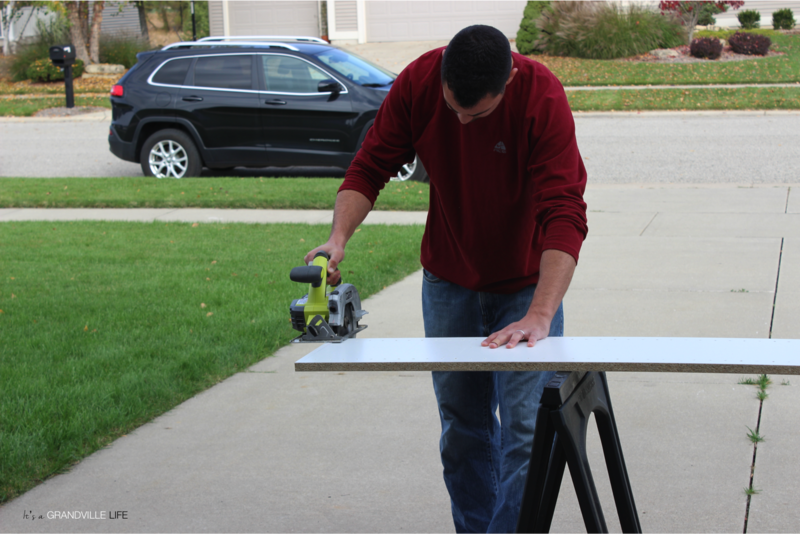 Note: in order for the board to sit flush to the wall you need to cut an area out that will account for the depth of the trim. Next we installed the bars. The top bar we extended all the way to the wall so that the far left corner would allow me to hang some of my dresses. Next we installed the bottom bar. 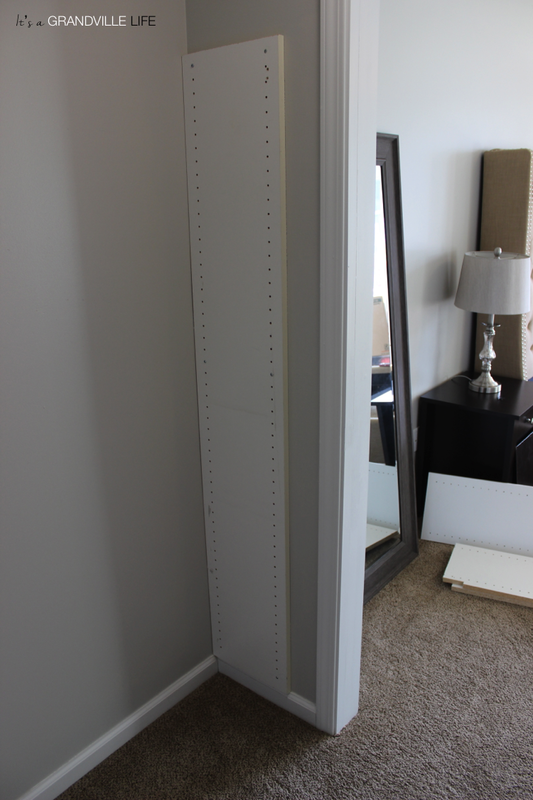 The bottom bar can be pushed in further or pulled out more, depending on how much dress hanging space I want. We also used one of the old boards to put above the top bar for additional storage. Here are the double rack of bars installed on the right. 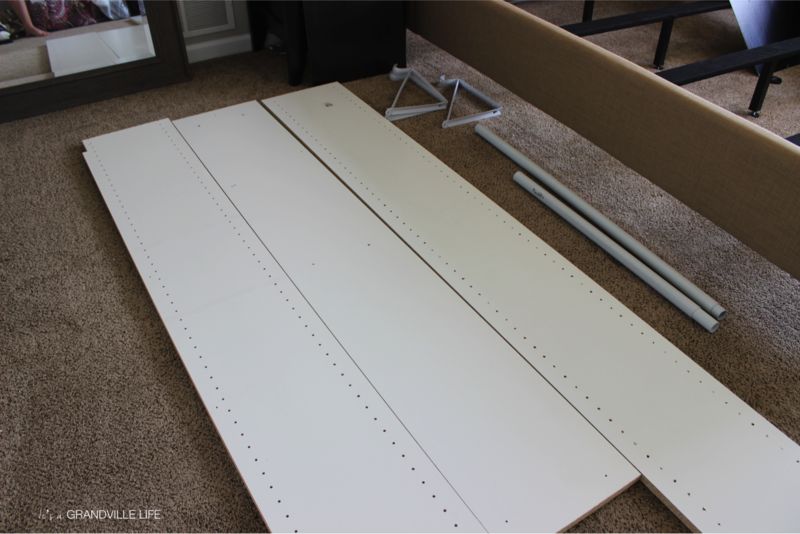 By having double bars on both sides of the closet, it nearly quadrupled the hanging space. 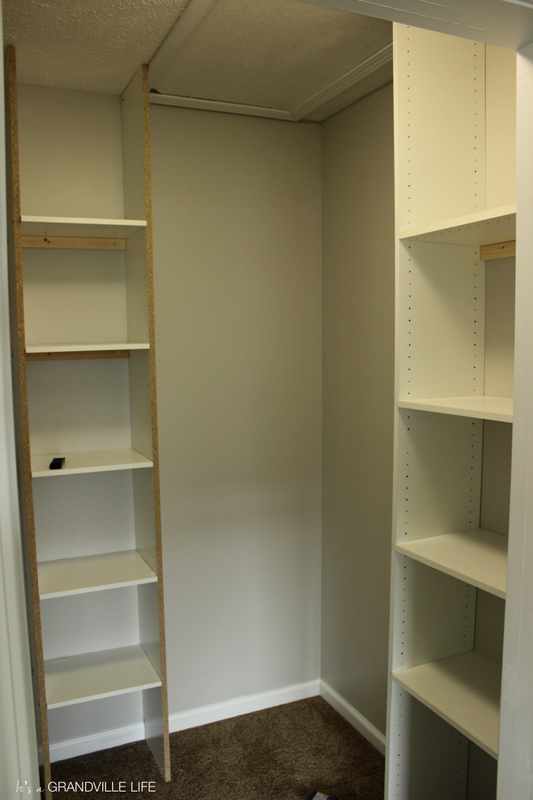 After installing the bars, we then painted the shelving white. 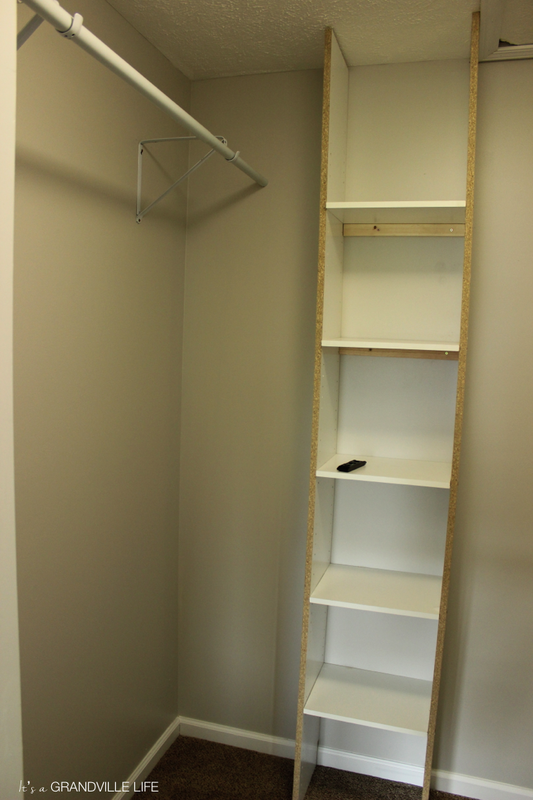 The inside of the closet is now finished! 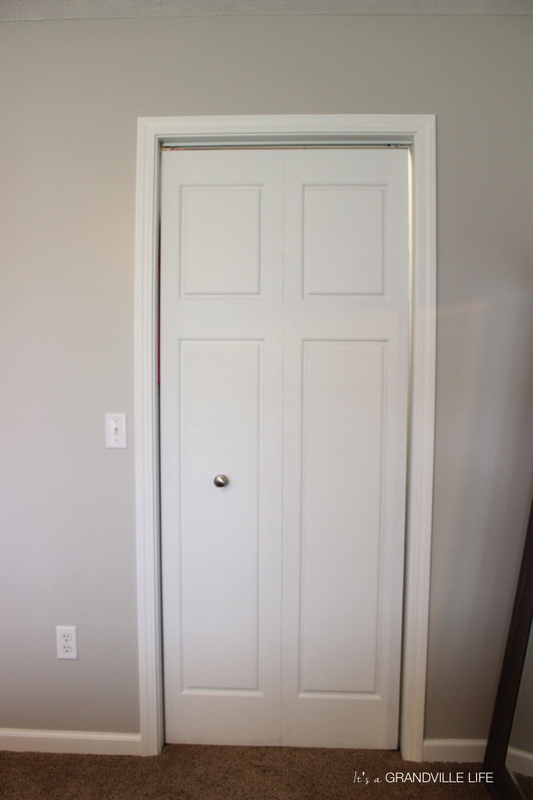 As I said earlier, the HUGE problem with the closet was the inward swinging door. That said, we removed the door and added a bifold door. That way we could have a door, but it wouldn't occupy any of the closet's space. The bifold door came in an tan color so we painted it to match the trim and door into the master. And voila here is the finished product with clothes! Although I wasn't able to fit all of my clothes in here, I now only take up one other closet in the house which is definitely progress for me! What helps maximize my side of the closet even more, is that I predominately use the non-slip space saving hangers from Costco. They are about half the size of a standard plastic white hanger, and therefore definitely make a difference . Also, don't mind my bad folding skills but shelving is really nice if you are like me and don't like hanging your delicate sweaters up because of them getting hanger marks. 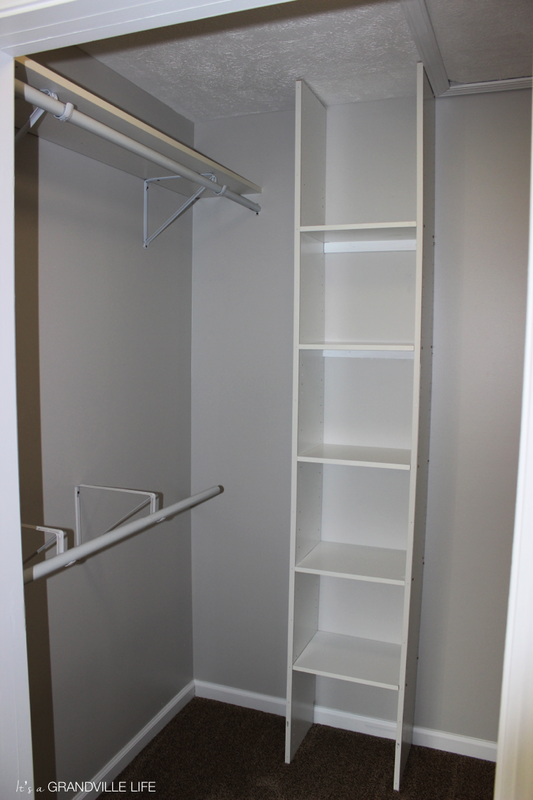 One of my favorite parts of the closet is that our design also incorporated a space for our laundry hamper. Since our house only has a laundry closet, there was no space until now to store it. 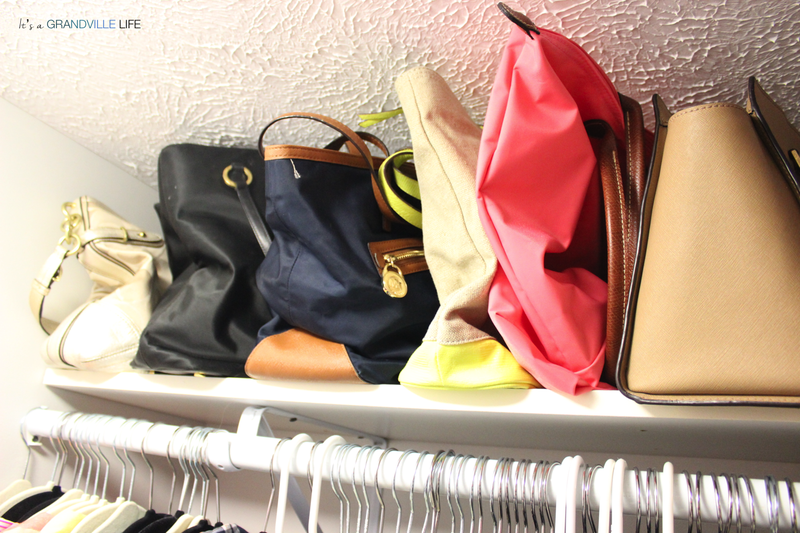 The shelf above the top bar has been a great place to store some of my purses. It's currently to high for me to reach without jumping, but thankfully it's Black Friday this week so I'm hoping to score a good deal on a step stool. Also, I show you this image, because the reason we didn't add a shelf on the top bar on the right side is because we had to leave enough room to access the crawl space to the attic. 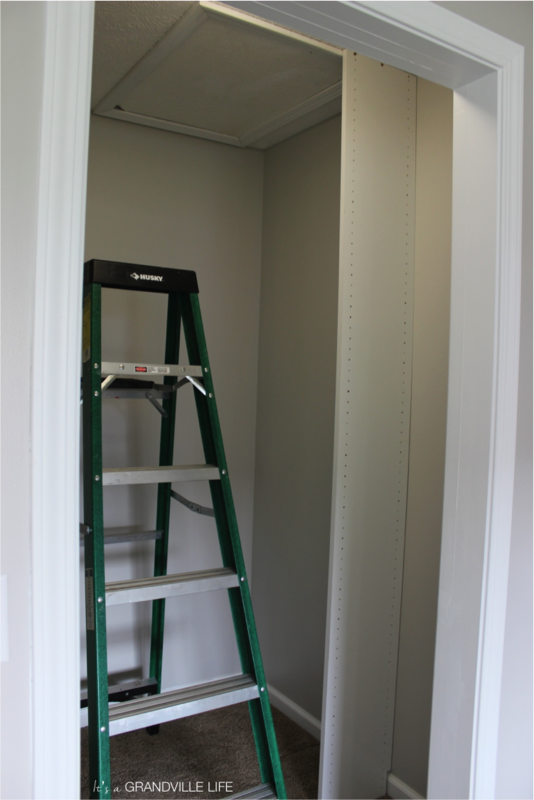 If you re-do your closet and have your attic access in your closet, make sure to keep this in mind when coming up with your design. 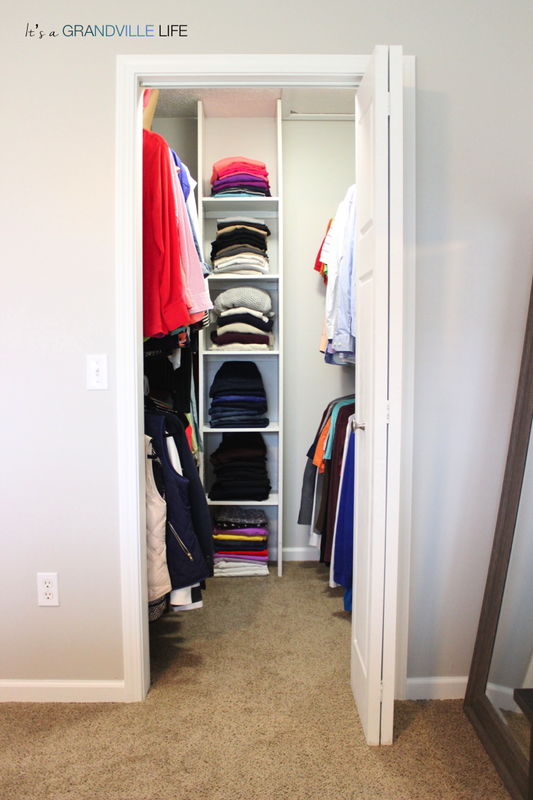 Well I hope you liked our master closet makeover. Let know what you think in the comments below, find me on Facebook, and see what I'm up to via Instagram! 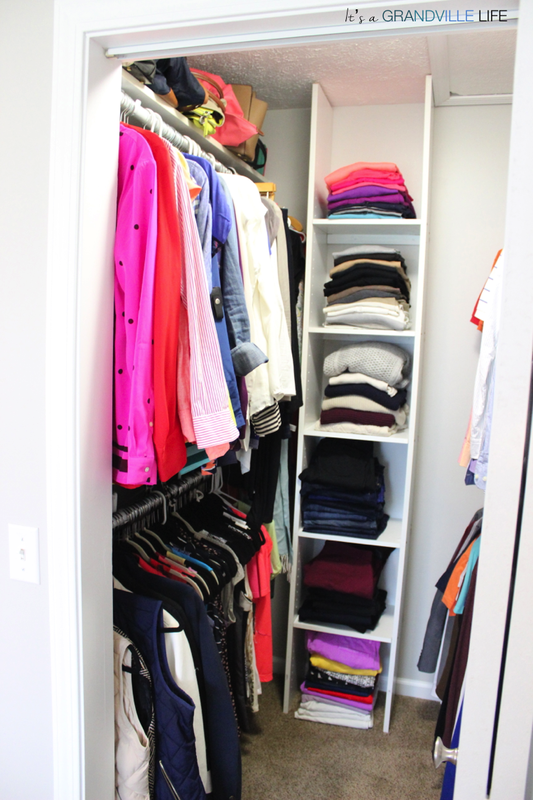 Also, if you do your own closet makeover, I'd love to see pictures of it!